I woke up a bit late around 5:15am. I was supposed to woke up around 4:45am before Subuh. Aku mandi, sembahyang, a light breakfast of 1 slice of cheese sandwich, powerbar chocolate gel, a glass of berocca and a glass of water. Last 3km - My energy level is very low and my stomach is empty, so I walked (fast walk) all the way home. A slice of cheese sandwich is not enough for the long run (take note). Yesterday afternoon, as usual we did another mountain biking at McFarm. This time, my other brother has joined us as he has bought new offroad tyres for his MTB. So altogether 6 riders. kami noticed jalan offroad di McFarm sedang diperbaiki supaya kereta dapat melalui jalan jalan tersebut dengan selamat. I heard they bulldozed the road sampai ke Jerudong. Maybe next month, kami mencuba lagi jalan offroad ke Jerudong. Thursday, I went for a afternoon swim at the stadium. Just a quick 30 mins swim. The upper level was closed, so pakai swimming pool sebelah bawah. There were only 4 swimmers around. I did around 2 loops from end to end without touching the wall end. 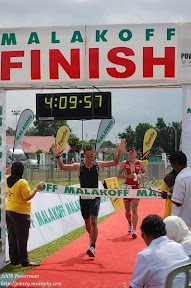 I need to get more practice if want to compete in next month triathlon at Miri.